Edith "Edie" Massey, aka Edie the Egg Lady, was born today, May 28, in 1918. She was an American actress and singer. Massey was best known for her appearances in a series of movies by director John Waters. She was one of the Dreamlanders, Waters's stable of regular cast and crew members. Born in New York City, Massey was one of 10 children. According to Massey's brother Morris, their parents "just threw up their hands one day, dropped off those who couldn't fend for themselves at a local orphanage or 'home,' and disappeared." In the 1975 documentary Love Letter to Edie, Massey said she was raised in an orphanage and eventually was placed in a foster home. Her foster family members were cruel to her and, as a teenager, she ran away to Hollywood. 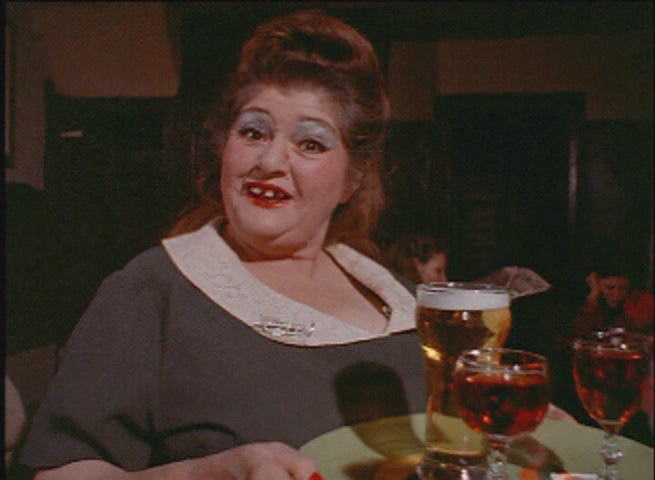 In the documentary Divine Waters (1981), Massey explained that she was "born in New York, but raised in Denver, Colorado....I was movie crazy, so I went to California to try and get in the movies, but instead I became a barmaid." In 1946, Massey married a soldier, Silvio Gigante, in Reno, leaving him about 5 years later because she got "restless." However, in Divine Waters, Massey said that the marriage lasted "about 7 years. It was my fault; I left him for another man, so I blame myself for it." She worked in several odd jobs through the years, and she eventually relocated to Baltimore, Maryland where she worked as a barmaid at Pete's Hotel. Filmmaker John Waters met Massey while she was working at Pete's Hotel in 1969 and offered her a role as herself in the film Multiple Maniacs. In the early 1970s, she quit her job at Pete's and opened a thrift store called Edith's Shopping Bag in the Fell's Point area of Baltimore. Massey gained a cult following from her appearances in five films directed by John Waters: Multiple Maniacs (1970), in which she appeared as herself and, in a dream sequence, as the Virgin Mary; Pink Flamingos (1972), playing Divine's egg-loving mother, Edie; Female Trouble (1974), as Aunt Ida; Desperate Living (1977), as the evil Queen Carlotta of Mortville; and in her final role in a Waters film, Polyester (1981), as Cuddles Kovinsky. In the late 1970s and early 1980s, Massey capitalized on the infamy of Waters's films by touring as the lead singer of a punk band, Edie and the Eggs. She also posed for a series of greeting cards. Later, when the Baltimore winters became too much for her to endure, she moved to Venice, California, where she opened another thrift store with the money she earned from acting in Waters's films. In 1980, she was featured in John Mellencamp's music video for "This Time" and also appears on the cover of Mellencamp's album Nothin' Matters and What If It Did. In 1982, Massey recorded a cover of The Four Seasons' "Big Girls Don't Cry" that was included on the compilation albums The Rhino Brothers Present the World's Worst Records and A Date With John Waters. The year she died, Massey starred in her final film Mutants in Paradise. Massey died of complications of lymphoma and diabetes on October 24, 1984 in Los Angeles.